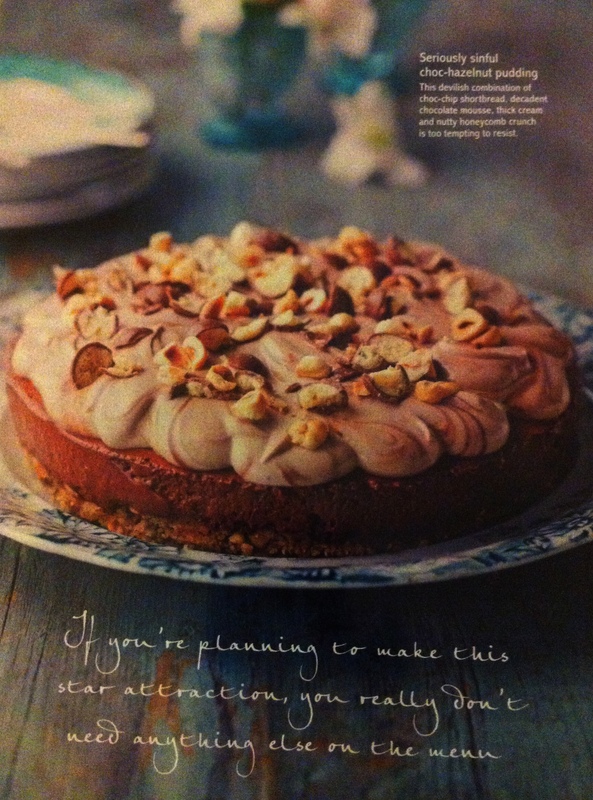 You may be starting to think I am obsessed with the Better Homes and Gardens magazine – I don’t think I am but they are just full of such amazing recipes that seem to tempt me from the pages taunting ‘Go on you can do this or don’t you think you are good enough? Come on surely you want to have a mouthful of this culinary perfection?’. As you already know I have an addictive personality but I’m also competitive so I just can’t say no! Can I just say this is a truly wonderful pudding. Sinful is the best way to describe it and I swear I saw my work colleagues protecting their slices whilst nervously looking around to ensure no one was going to steal a spoonful. The hazelnut and choc chip shortbread base provides the perfect platform for the fluffy and decadent mousse to rest on and the maltesers give that malty texture which crescendos with every mouthful. There are no other words for it you just have to make it yourself. Preheat oven to 180oC. Put hazelnuts on an oven tray and roast for 5 minutes. Transfer to a clean tea towel and roll around to remove skins. Grease a 20cm springform cake tin with melted butter and line with baking paper. Put 50g of the hazelnuts in a food processor, pulse until chopped, then transfer to a bowl. Put shortbread in food processor, and pulse to create crumbs. Add to hazelnut, then add extra butter and stir to combine. Press mixture into base of prepared tin. Smooth with the back of a spoon and refrigerate for 30 minutes. Melt chocolate and 100ml of the cream in a heatproof bowl over a saucepan of simmering water. Stir until smooth. Remove from heat and whisk in egg yolks. Set aside to cool slightly. Beat eggwhites in a large bowl until soft peaks form. Gradually add sugar, beating well, until mixture is thick and glossy. Add a large spoonful of eggwhite mixture to chocolate mixture and gently fold in using a metal spoon. Fold in remaining eggwhite mixture until combined. Pour onto biscuit base and put in fridge for 2 hours or until firm. Put remaining cream and liqueur in a medium bowl and whisk until softly whipped. 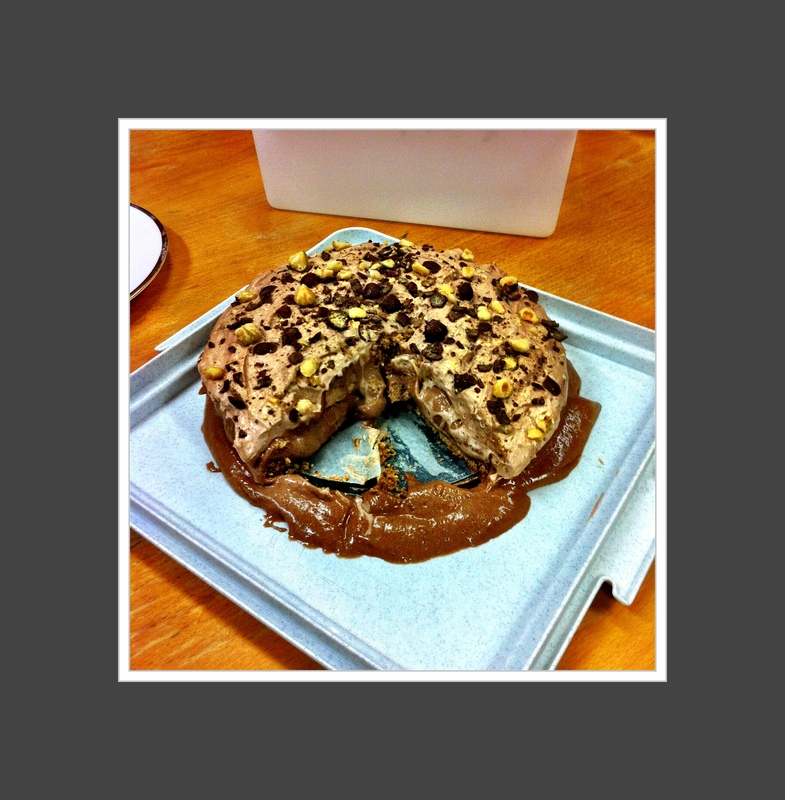 Swirl through Nutella and ½ of the Maltesers. Top mousse with cream mixture. To serve, dip a clean tea towel in hot water and run it around the outside of the cake tin a few times to loosen pudding. Remove from tin and serve scattered with remaining hazelnuts and Maltesers.